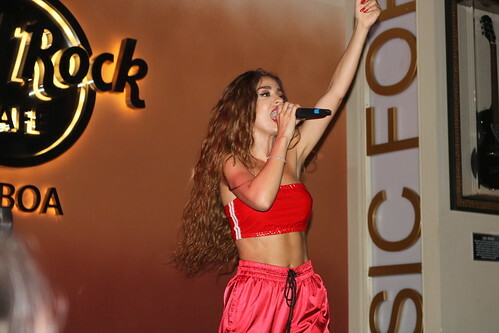 Cyprus artist, Eleni Foureria, has been emerged to win the Eurovision Song Contest with her song Fuego on Saturday’s final. A-P Records and Panik Records are the labels behind the song that has been written by a team of Swedish songwriters and distributed via Record Union. On Saturday May 12th, the final of the 2018 edition of Eurovision Song Contest will be held in Lisbon, Portugal. Among the finalists stands Eleni Foureria from Cyprus, together with the record labels A-P Records and Panik Records. The song Fuego has, among others of Eleni Fourerias songs, been distributed on Record Union’s platform. - Record Union is happy to work as a distribution partner to A-P Records and Panik Records. We’re very excited to watch and follow Eleni Foureria in the Eurovision Song Contest final on Saturday and we'll keep our fingers crossed for a win in Lisbon, says Johan Svanberg, CEO at Record Union. Behind Fuego stands a team of Swedish songwriters: Alex Papaconstantinou, Geraldo Sandell, Anderz Wrethov, Viktor Svensson and David “Didrick” Franzén. Romania gave a good vocal performance and is now shorter than before. Denmark also assured the markets of qualifcation. Russia seems to be in trouble according to the odds. And the markets seem to have lost in Serbia after tonight which drifted heavily. First at all - why there are only four hostes and will the number grow to eight for the final? As I've missed a lot rehearsals, I'm gonna watch tonight as if I've just switched my TV on without knowing what is going on. I totaly agree with Desirée. Fairytale reloaded and Oslo might come back as Eurovision host. Oh, those masks are scary. Put your kids away from television if you don't want to get a sleepless night. And again, I'm totaly agree with Desirée. "Goodbye" is a song which could work for Eurovision but the performans kills it. Shame. Wow. Great, unusual, but with a catchy melodie. Pop meets ethno. Strong voices. I'm afraid it still too unusual for the average national audience, but I really would like to see Albert Einstein with his panpipe in the final again. Well. Don't think, it is going through the semi. At least both ladies AND the robots are enjoying themselves on stage, don't they? Again - agree with Desirée. A solid show, charismatic artist with a good voice and a strong message (too much make up for a viking though ;) ). My colleague was singing along and the press center applauded. There are so many questions on that perfomance I won't never get answered. Why the montain, why the dancer, why an outfit from the grandmom's wardrobe? I was so distracted, I couldn't concentrate on the vocals or the song, which is a shame, as they are quite good. Still, the audience liked it. C'mon, Julia, you can do the Final. Sometimes less is more and that definitely the case of Waylon's performance or rather the performance of his stage entourage. Those break dancers will break your neck in the Semi, hon. However, it is still a cool radio song that I've already added to my spotify playlist. Without the dancers. A very strong vocal performance, but the dancing seems to be a tribute to "Puppet on a String" and, unfortunately, the camera shots don't flatter Jessica. One of my favorites this year. The vocal energy rises with every moment. But I'm afraid the music is too sophisticated and the show too classical for the Final. Agree with Desirée: quite flat vocals even with some noticeable breaks, but a wide voice range isn't required for dance pop. Cool staging, catchy tune, could work. Again, less is more. Strange cheesy visuals which distract from the song but, unfortunately, not in a good way. She seems to relax and gain confindence during the performance, but will it help? Can't write - need to handbang now. Finally something authentical came up on the Eurovision horizont. This entry shows that the contest IS open for all genres beyond the limited frames of commercial music. I would love to see them at the Final and I'm sure, I will. Good vocal performance, but an average performance. If Justin Timberlake and Justin Biber would merge together, Benjamin Ingrosso will be the result. Absolutely love it. A radio hit, sung by a very very very charismatic artist and supported with a stunning but still very simple stage set. Less is more, as I said. Smooth, powerful voice, but the entry is too traditional. A modern staging, performance and costumes could have bring it through the Semi, but I'm afraid, he's gonna stuck here. No time to keep thinking of what happened yesterday as the first dress rehearsal for tomorrow's semi-final is already in full swing! Later on we will fill you in on what happens on the postcards as well.. This is becoming a solid favourite for the win, the performance is slick and it's a cheerful opener. But the question remains how much juries will take this song seriously. Alexander seemed to be saving his voice. Vocally this is very strong again, but the performance is too theatrical, too kitsch for this song. I will not be surprised if this will be the end of Romania's perfect streak. Good performance in this rehearsal, it keeps getting better and better. After Romania I think this has a chance. The robots and Jessika and Jenifer as well are back! Size doesn't matter was one of the messages on the cards held by the robot. It may distract from the sometimes weak vocals at the end. Another good and solid performance from Rasmussen, really not much to say about this, it looks and sounds very well, no issues at all here. The vocal arrangements in the chorus seems to have been altered a bit, it sounds a lot more shouty now especially during the long notes. Really hard to predict what will happen here. Time for a little break now in the greenroom, with a little game with Alexander Rybak among other things..
Not sounding that great today in the hall, could be that they are saving themselves for tonight. It's still a fun performance though. Putting Waylon's stage together apparently takes a bit more than the time of the postcards, as just after the postcard we got switched to one of the hosts in the audience for a very awkward conversation that went completely wrong. Let's say "It's just a rehearsal" as San Marino reminded us a few days ago. Now, to the actual performance. Vocally it sounds really good and it is not completely my genre but I feel we're back to real music after a few weaker songs. There are far less shots of the crumping dance right now, so it looks better. I think there's still a chance for the Netherlands. Back to the greenroom again! That's how they fill three extra minutes it seems being this the semi with one song less. Very strong vocal performance from Jessica. It's one of the few straightforward pop songs and still think this could really have an instant appeal. I do think however that the shots during the bridge where Jessica is dancing are not that great. There seemed to be some issues with the sound at the beginning as it started a bit weak. Iriao soon got back on full strength though. With a few of the ethnical entries out from the first semi-final gone it could really stand out in the final if it qualifies, which I hope, as the last part was absolutely beautiful. Vocally not the best performance. The many pyro fountains and the catchy song might distract from it. Lots of flames at the beginning of this performance, very strange, likely to be a technical mistake. There seems to have been done a lot of work on the lighting of this song as there are now many laser effects. The light show could get the audience to go for this more than we expect now. After these 6 songs it's time for another break in the greenroom. Those were three very intense minutes - very energetic performance as always and it does stand out. Still a very theatrical performance as well even though Laura seems to have toned the hair swinging down a bit and that's only for the better. In the bridge she struggles vocally. Semi final one....shocks and surprises? Israel. Again we both got this one, again this is probably deserved, but again the song is starting to grate a little now. Bulgaria. This is such a grower of a song, so we both out it through but not sure if it was deserved or not in the end. Ireland. Kinda made our Eurovision week - perfect! And shocks for us, both Azerbaijan and Armenia missing out. Thought at least one of them would go through. Sad a little for Croatia, and Greece - both of whom we count as delegations that are friends as well as co-workers. Iceland - again we were sad - but really this is because of Ari himself and not the song. Belgium, she did a great job but in the end the song was a little too clever for Eurovision. Belarus - the staging killed this, really poor showing from the delegation that usually gives us such a great show. Macedonia - even though it possibly one of my favourite songs, it did not translate very well on the live stage - so BOO! Read more about Semi final one....shocks and surprises?